Here are some photos from SOS' 13th Annual Wild and Crazy Taco Night held April 27 at their facility in Costa Mesa. Joy was there too and helped with the majority of the captions. Proceeds from this charitable event went towards helping the homeless in Orange County. Joy's notes: "Yucatan green chile chicken taco prepared by Alan Greeley of The Golden Truffle (This was my favorite!)" Dessert by The Atrium Hotel on display - Joy's notes: "Xango - pastry wrapped like a burrito around a creamy filling, covered in powdered sugar, with chocolate and fruit sauces on the plate"
Joy's notes: "Roasted achiote pork taco prepared by Carlito Jocson of the Yard House"
Joy's notes: "Alan Greeley (in hat) at the Golden Truffle station"
After my previous failed attempt to find the Ladera Ranch location of Taco Mesa I tried again and found it this time. If you go looking for it don't pay too much attention to the numbers on the street because they could be misleading. Just get off the 5 freeway at Crown Valley Parkway and drive about three miles east to Bridgepark Plaza and it'll be on your right hand side. It is said to be in Ladera Ranch but as Ladera Ranch is an unincorporated segment of Orange County it also sort of counts as being in Mission Viejo. Taco Mesa is a four store chain that is the slightly more blue collar version of the somewhat more white collar Taco Rosa, all of which are run by Ivan and Marco Calderon. My brother and I arrived at Taco Mesa just in time to still get breakfast and found that a lot of early risers were there finishing up their breakfast, some inside and some taking advantage of the outside seating and the expansive view of the arroyo it offers. I ordered a quesadilla mañanera, described on their official site as a, "Whole wheat quesadilla filled with cheese and eggs scrambled with tomato, onion and cilantro. Served with sour cream and fresh fruit." The quesadilla was perfect in every way except that I couldn't pick it up and eat it. It was just greasy on the outside and floppy so that if I picked it up all the filling would fall out so that I had to eat it with a fork. I mentioned this same minor complaint with Taco Rosa; just make the outside a little crispier and keep the filling together better. This could be accomplished by cutting down on the amount of grease it fries in and maybe using a layer of cheese covering most of the inner side of the tortilla before adding the other fillings. Then maybe some more cheese. Then all the filling ingredients are sticking to at least a little bit of cheese and not just loose and rolling around and falling out. Still, it was a feast for the eyes and the taste buds, and when my brother saw it he remarked that he should've ordered it himself. He had already forgotten that I had tried to tell him to order it but he had ignored me and ordered one of the non-breakfast quesadillas. Better luck next time. Just like Taco Rosa, Taco Mesa makes up two types of aguas frescas fresh each day. Today they had mixed fruit and horchata, and I went for the horchata and found it to be very full-flavored without going overboard, perhaps the best horchata I have had. Gustavo Arellano, in the O.C. Weekly, referred to Taqueria de Anda as the Carl's Jr. of Mexican food but after pulling up in the parking lot of their Orange location I was thinking it was more like the McDonald's of Mexican food, especially with the playground out front. Then after stepping inside and seeing their rather abbreviated menu I started to think they were more like the In-N-Out of Mexican food. Here you've got tacos, burritos, rice, beans, and drinks. The variety comes from the different types of meat that can be stuffed into the tacos and burritos. Taqueria de Anda has seven types of meat from which to choose: carne asada (steak), al pastor (barbecue pork), lengua (beef tongue), cabeza (beef head, but I believe it is mostly brain - somebody correct me if I'm wrong), pollo, carnitas, and buche (fried pork stomach). The tacos are very small and are made to order, or more like as you order them. I decided to try one out-of-the-ordinary meat and two "ordinary" ones ("ordinary" being relative to my own experience) so I ordered lengua, carne asada, and carnitas, and some rice. My friend Chris reversed the ratio by ordering carnitas, lengua, and buche, and some beans. Everything was acceptably fresh and we both agreed that the "unusual" meats didn't taste all that unusual. Taqueria de Anda's tacos didn't quite fill me up but I should've known up front that they wouldn't when I saw how small they were. They've got a salsa bar with the requisite mild, medium, and spicy salsas, plus salsa verde, radishes, escabeche, and some citrus fruits that looked like a cross between lemons and limes. They weren't exactly chartreuse, but more of a yellow background with streaks of greens. Made me think of when Sprite used to advertise that it had the "Great Taste of Limon." And they have Horchata Ole! to drink, so that's a definite plus. And if you ever get the urge at 3 in the morning to load up on some tacos keep in mind that this location is open 24 hours, 7 days a week. I've been debating whether to give Taqueria de Anda three or three and a half Speedy Gonzaleses. Right now the angel on my shoulder is saying to go for the high end. Part of my reason for starting this web log was to give myself a systematic way to explore the county I grew up in. There's really a lot in Orange County, more than most people are aware of. I've compiled this list so I can check off the cities covered so far and to show what cities are left to go to. Some are actually communities and other currently unincorporated areas of the county. For a list of actual restaurants covered so far check out the entry entitled Where Have We Been? If anybody knows of any obscure Mexican restaurant in any of the lesser-known areas or you have knowledge that a particular area does not have any Mexican restaurants, please leave a comment. My Italian chef boyfriend (I lucked out!) introduced me to El Gallo Giro in Santa Ana. Apparently they are a small chain. It's in a small strip mall off of Edinger and S. Bristol. We went on Sunday night, the place was packed. The place is open 24 hours and according to my boyfriend, they are always very busy. There was a security guard inside the restaurant near the cash register, and another in the parking lot. Interesting! I wish I had a camera with me, the restaurant gives you full view into the kitchen with all the work going on . . . it's dizzying to see, and very entertaining. When you arrive in the restaurant, there are 2 lines: one for their prepared foods . . . which all looked wonderful, and a separate line for Tortas. We stood in line to order the "Torta Cubana" ($6.99) a sandwich with bread from their bakery next door, which has: marinated pork leg, breaded beef, ham, head cheese, avocado, cheese, and beans and a chile. It was great! The place reminded me of that SNL comedy sketch where they say "Cheeseburger Cheeseburger Cheeseburger!" Except here there was a guy saying, "Torta Torta Torta!" The Torta Cubana was so big I couldn't finish it and that's saying A LOT. :) They also have "aguas frescas." I had the tamarind drink and my boyfriend had the banana. Very nice! We waited 20 minutes in the Torta line, but it was well worth it. The place is mainly for carry-out, although there is a small strip of seats along the window. Their bakery next door is incredible with the best pan dulce I've had in California . . . soft, and made with cinnamon tea, and very inexpensive. I would recommend this to anyone wanting authentic Mexican food. Looking for food ideas in Orange County? BarrysTickets.com has Los Angeles Restaurant information as well as Orange County Segerstrom Hall Tickets and great deals on Phantom of the Opera OC Tickets. Here's another memorial to a long-gone, kitschy, 1970's phenomenon. Pup 'n' Taco served hot dogs and tacos. Both were very basic and mass-produced. I think all their restaurants were A-frame buildings. But the best thing about Pup 'n' Taco is that they had very good grape slushes. I still miss those things. If anybody else has memories or pictures of Pup 'n' Taco please leave a comment. 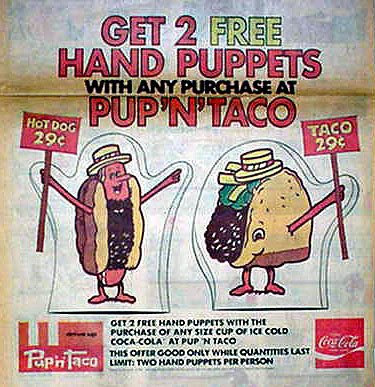 Oh, and faithful blog reader Eric H. just sent me this link to a page that has even more Pup 'n' Taco pictures. UPDATE (March 12, 2008): Agave has closed down. It has become an El Torito Grill. Right next door to RSM's OPRAH, I mean, OPAH, is Marc Cohen's third restaurant, Agave Mexican Grill and Cantina. Can it claim itself as an "authentic" Mexican restaurant when its owner is clearly not Mexican? Hard to say, but the food is at least serviceable. The setting is very trendy, which nowadays means it also includes some classic elements but also enough nouveau elements to please the jetsetting crowd. Since I'm behind on about four or five entries now I'm going to mostly let the pictures do the talking.